The team of MILabs wishes you all the best for 2016. 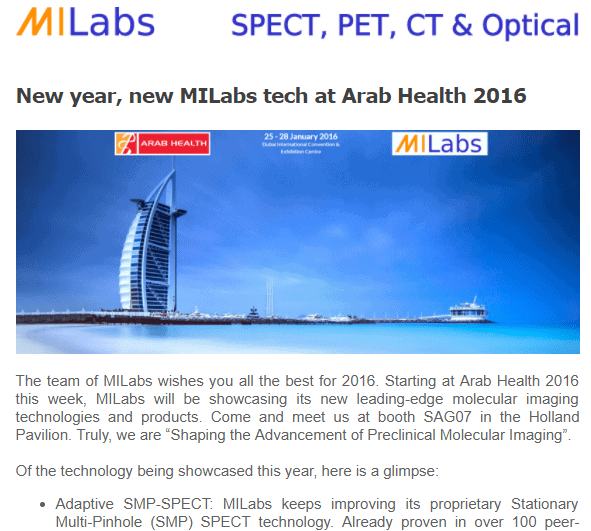 Starting at Arab Health 2016 this week, MILabs will be showcasing its new leading-edge molecular imaging technologies and products. Come and meet us at booth SAG07 in the Holland Pavilion. Truly, we are “Shaping the Advancement of Preclinical Molecular Imaging”. Adaptive SMP-SPECT: MILabs keeps improving its proprietary Stationary Multi-Pinhole (SMP) SPECT technology. 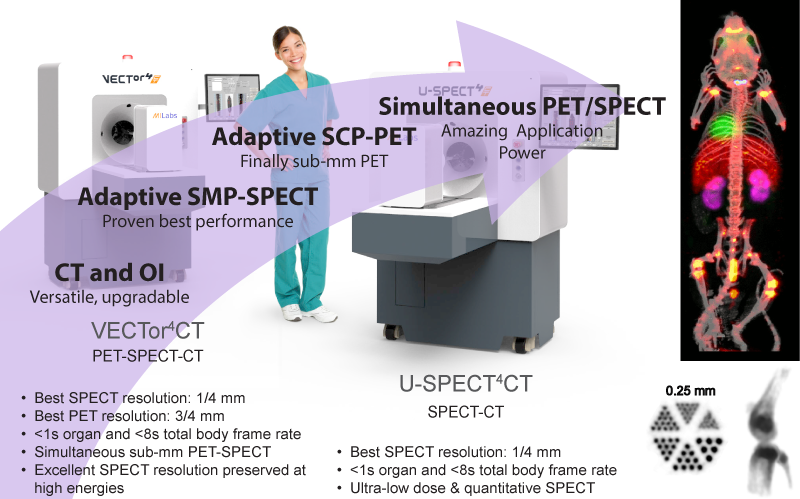 Already proven in over 100 peer-reviewed scientific articles, its latest U-SPECT4CT raises SPECT imaging to the molecular sensitivity level of PET with resolutions down to 0.25mm. Now you can acquire dynamic SPECT images of organs at less than 1 sec and total body at less than 8 sec time resolutions. Adaptive SCP-PET: After years of development, Adaptive PET supported by Stationary Clustered-Pinhole (SCP) collimation has finally reached a performance level unmatched by conventional coincidence PET systems. With improved sub-mm resolution and similar molecular sensitivity, Adaptive PET as implemented on the VECTor4CT enables you to image mice structures with the same visual clarity as can be achieved from imaging humans. Simultaneous PET and SPECT: By combining Adaptive PET and SPECT in a single VECTor4CT system, simultaneous high-resolution imaging of co-injected PET and SPECT tracers will offer you great potential to expand your small-animal research applications as it allows the exploration of different physiological and molecular functions in one single non-invasive imaging session. New integrated solutions with Optical Imaging (OI), CT and MRI: MILabs integrated modular 4 series allows you to virtually meet any preclinical imaging need of your lab. With new OI and CT subsystems, you can now exploit the unique capabilities of adaptive PET and SPECT in combination with fast, low-dose, ultra-high resolution CT and versatile Bioluminescence & Fluorescence imaging. For a complete overview of our product overview please read more here. MILabs is pleased to announce that multiple molecular imaging institutes have already decided to acquire products from our recently introduced preclinical 4 series. One of these institutes, the University of California, San Fransisco has decided to expand the imaging capabilities of its renowned Center for Molecular and Functional Imaging by acquiring the VECTor4CT system, enabling simultaneous PET and SPECT imaging at sub-mm resolutions and fusing the images with X-ray CT at low dose. This PET/SPECT/CT platform is uniquely positioned to boost the center’s on-going translational nuclear medicine research, funded by the NIH, by providing new imaging capabilities to unravel biological processes in area of oncology, neuroscience and drug discovery & development. Read more here. To complement its Adaptive PET and SPECT systems, MILabs’ has introduced a new Adaptive CT system. 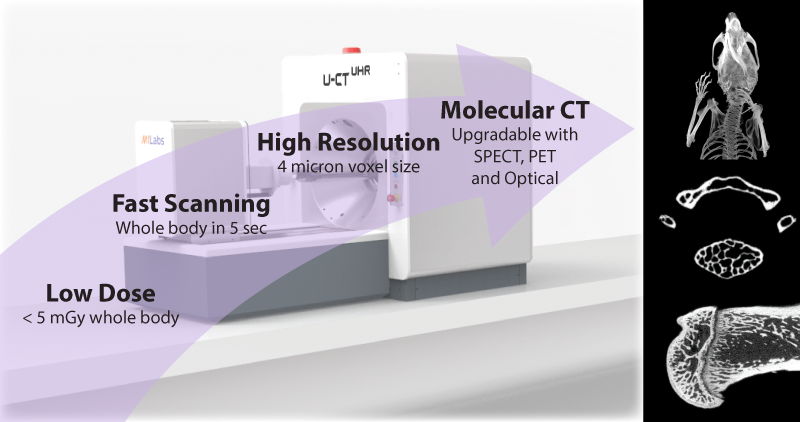 Consistent with its adaptive approach in nuclear imaging, MILabs new U-CT system will adapt to your applications so you don’t have to adapt your research. For instance, why invest in multiple systems for speed and resolution, for in vivo and ex vivo applications, or for molecular CT with SPECT, PET and Optical Imaging, if you can start your research with a single U-CT device today and expand your system by adding modalities over time?